Total alkaloid content in F.offinalis aerial parts was found 1386 mg/100g d.w. (138.6?) with main components fumarophycine (19-37 mg/100g dw), O-methyl fumarophycine (17-29 mg/100g dw), and protopine (17-22 mg/100g dw). Total phenolics content in F.officinalis was 2600-2900 mg/100g dw. (?) Fumaric acid was found in all of 8 Fumaria species. 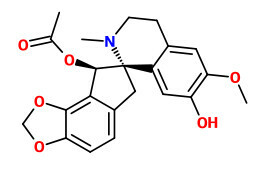 Protopine exhibited the known papaverine-like musculotropic (antispasmodic) action. Electric field stimulated contractions of isolated ileum of guinea-pig were antagonized by protopine more than by coptisine and chelidonine. Uusing ethanol 50% (w/w) at a temperature of 79 °C with a 3% solid-liquid (w/w) ratio, the weight of protopine extracted from 100 g of F. officinalis was about 230 mg.